We've just celebrated Earth Day, but I'm here to talk about Jupyter -- and the SAS open source project that opens the door for more learning. With this new project on the github.com/sassoftware page, SAS contributes new support for running SAS from within Jupyter Notebooks -- a popular browser-based environment used by professors and data scientists. My colleague Amy Peters announced this during a SAS Tech Talk show at SAS Global Forum 2016. If you want to learn more about Jupyter and see the SAS support in action, then you can watch the video here. There is even a Notebook extension (./nbextensions/showSASLog) that can show you the SAS log. Update 25July2016: Support for Jupyter is now part of the SAS University Edition! See the SAS University Edition documentation for information about how to use it. Access to the OS shell to install/configure the Jupyter Notebook infrastructure and the sas_kernel. End users of Jupyter Notebook do not need special privileges. And you can access it from a browser on any system: Windows, Mac, Linux...whatever. In the SAS Tech Talk video with Amy, we were running on my Windows laptop using Chrome, connecting to a Linux instance of Jupyter and SAS. The GitHub project has all of the doc and step-by-step instructions for installation. What's next for SAS and Jupyter? This is just the start for SAS in the Jupyter world. Amy says that she has already received lots of interest and feedback, and SAS is working to make the Jupyter Notebook approach available in something like SAS University Edition and SAS OnDemand for Academics. Stay tuned! One of the best features to come out for SAS recently! Looking forward to being able to try this. I wonder if there will be any possibility (some sort of add-inns or upgrade) in a way that the same job can be done by SAS 9.3. I think that the current sas_kernel relies on a few features that are in SAS 9.4 only. I don't know if there are any plans to back-port to 9.3. 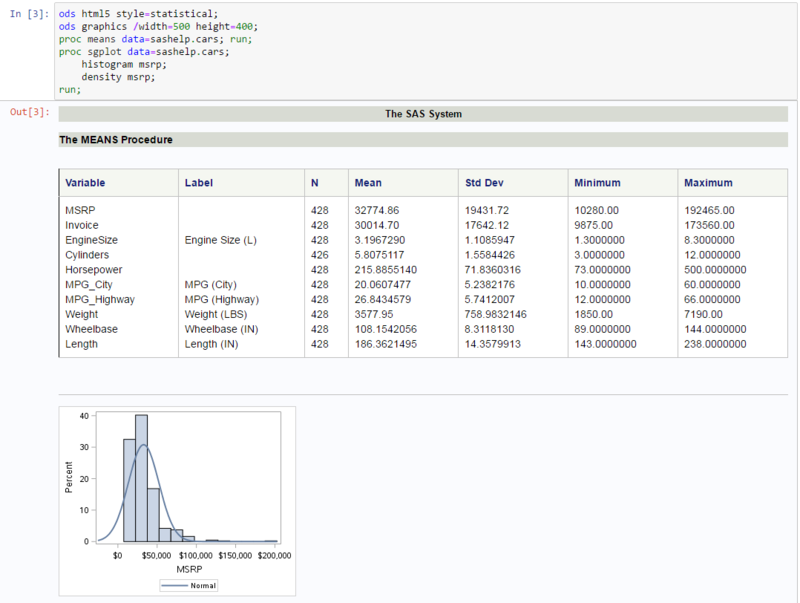 There would have to be investigation of how to render results using an engine that shipped with SAS 9.3 You can enter an issue on GitHub (https://github.com/sassoftware/sas_kernel/issues) but I think many SAS users would encourage you to upgrade to SAS 9.4 so that you can take advantage of all the features and improvements over the last 5+ years. Great news, but does it (or when) support windows? I think we heard this request several times at SAS Global Forum. I know that Windows support is under consideration; I don't know the timetable. As Chris said we are evaluating this request but I don't have a timetable as of yet. I want to second the motion to make this work on windows. On a lark I googled "sas kernal jupyter notebook" and found this recent announcement. I am very excited. I use python + jupyter to memorialize my work ("ask the data questions and write down the answers") and have been wishing for the same thing with SAS. Hi, its almost 6 months since this was announced. Any news on support for Windows? Hi Will, nothing to share yet. I did have a conversation with the developers last week, and they were looking into an approach...but it's premature to say when it will happen. The Linux requirement is a bit odd, since the Jupyter kernel could control SAS on Windows via the .NET interface using pywin32 or a similar module. I'll have to look at the source to see how the kernel connects to SAS. I think the team worked on Linux first, as that's a popular multi-user SAS platform where Jupyter can have a positive impact on teams. And also the SAS University Edition is delivered with a packaged Linux VM, so this will be a natural fit...eventually. I think Windows support is inevitable, just wasn't the focus right out of the gate. I suspect the mechanism will need to be a little different for Windows. Hi Bjorn, I'd guess the answer is Yes, on a technical level. However, SDD has some pretty strict auditing/authentication/process requirements, so I'm not sure if it's fit for the purpose. If you're working with a SAS-hosted SDD environment, it might be worth asking your SAS rep about this possibility. How does this work if I have SAS grid and Jupyter is on remote server? In short, if I have server based environments as opposed to SAS and Jupyter software on my pc? Hi Kevin, great question. I think that the way this works right now it doesn't play into the Grid environment. That is, you have Jupyter hosted on a single node where you have SAS available, and it launches/communicates with a single SAS process. I'll ping the developer (Jared) to see if he has anything to add about this. Chris, I currently teach a Statistical Computing course using SAS, I migrated myself and my students over to using SAS EG as a programming interface, but I am wondering if this is the best way to go? Do you have a sense of what is being used as the programming interface in industry? Should I be switching to a notebook approach, or is SAS studio a better way to go? I have multiple courses I teach and I will be developing a first course for a new Data Science masters that uses SAS and I wonder if I should be using SAS-EG, SAS Studio or learning these notebooks? I have noticed that workflow is something students need to learn, instead of figuring it out over the years and that the programming interface has an impact on learning and I wanted to get a sense of which method to use as I go forward. Laura, these are great questions. A comprehensive program might use all of these (and more) for various aspects of data science (including data acquisition and prep, analysis, and reporting/publishing). But rather than hear it from me, I'd encourage you to work with one of our curriculum consultants. We have a brand-new resource page with more information for educators. Chris, any updates on support for Windows? Yes! It's there now with the latest updates for SASPy. I've been able to run this with my SAS and Anaconda Python installed on Windows. No SAS libraries or datasets to be explored (don't make mistakes), no syntax highlighting (don't make mistakes), the log will appear in a squished box with a scroll bar (don't make mistakes). Another tiny scroll box for results (don't worry, I'm sure your results are fine). Just ONE of the incredible replacements for Enterprise Guide coming to a SAS shop near you! Well, look, Jupyter Notebook is not for everyone, and for some of us who are accustomed to more sophisticated, interactive environments -- it does seem like a step backward into the console-only days. I think of this as the hipster coding environment. And if there is one thing that I know about hipsters, it's that they don't like it when tasks are too easy or straightforward. There's no school like the old school, after all. However, Jupyter Notebook does have support for dozens of popular coding languages, and it treats them all in a similar (albeit simple) way. 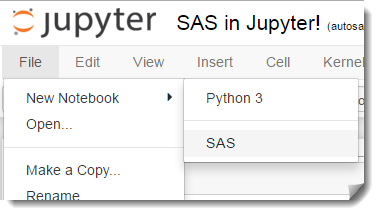 So it's one more option for Jupyter Notebook users who find themselves needing SAS analytics. Could we get a copy of that example notebook Amy Peters shows in the video (around 2:35 in)? Ooh, a deep cut there. I found a copy of the notebook code and placed it in a public gist. It's not complete -- no output and missing a referenced image. But hope it works for your purpose. Any SAS code should work, including macros. The % and %% chars have special meaning in Jupyter, so something might need to be escaped there. I'll have to test this particular program -- but in general, it should work. Hi，I find a problem in my jupyter. I cannot solve it. when I submit this code. This looks like you might be using a Chinese version of SAS, but running with an encoding that doesn't match with Jupyter. The best practice is to use UTF8 Encoding options when you launch SAS, which you can configure in your SAS startup command or in your sasv9.cfg. But the data is English. I try use my utf8 sasv9.cfg to replace zh sasv9.cfg. But the problem still exist. I only find the sasv9.cfg in "C:\Program Files\SASHome\SASFoundation\9.4\nls". Is this the file location? Some sample data that ships with SAS is localized, and can be different if using a different locale. Check the PROC CONTENTS for the SASHELP.CLASS to verify that the file is coming from an English directory. Use PROC OPTIONS to see where your config file is being read from. The sasv9.cfg is either in the same path as SAS.exe (and that will be a small file that simply references a locale-specific config), or in a larger SAS deployment this will be in your Config/Lev1 folder. Thank you for your help. When I modify my cfg. The problem is disappear. I can see the English data. But I have another problem, sorry. the tile is that doesn't match with Jupyter. I cannot send my screenshot to you.. Try posting this question in the SAS Programming board on SAS Support Communities. You can include your screenshot. Thank you for your help. I think my sas account have a problem. I will help to SASProfileHelp@sas.com and ask this question on SAS Support Communities. thank you.